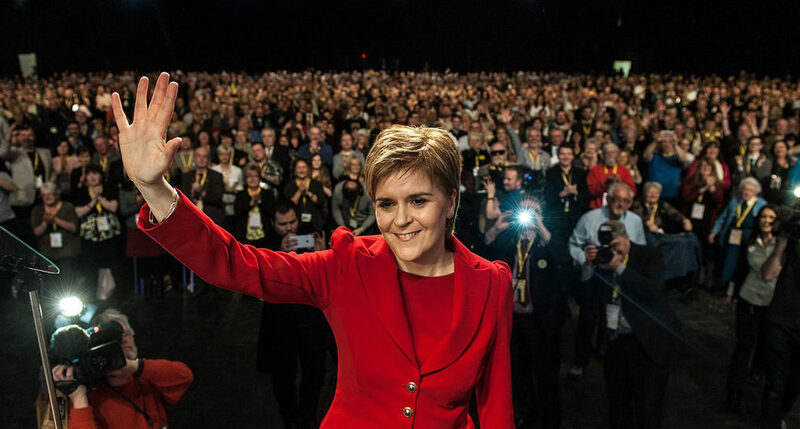 The SNP annual conference will be held on 8-10 October in Glasgow. It comes as Alex Rowley, Scottish Labour’s acting leader, claims that Scotland is past ‘peak SNP’. Support in the latest opinion polls has the party on 41% support in a future Westminster election, and 38% for a Holyrood election. Meanwhile, support for independence languishes at 43%, which is 2% lower than the Indyref result. These figures are hardly disastrous: the SNP share of the vote in the 2017 Westminster election was 36.9%, and the party took 41.7% in the 2016 Holyrood vote. But there is a tendency to judge the SNP’s performance against the 2015 Westminster general election when it took almost 50% of the vote. The 2015 victory was the product of disappointed Yes voters, who effectively decided on a long march through the institutions, joining the SNP en masse in the wake of the 2014 independence referendum defeat. The 2015 victory was as close to total as it could realistically be, but failed to deliver much tangible progress towards independence. Had 2015 resulted in a hung parliament and a Labour government supported by the SNP, things might have been different. But it did not. While 2015 was an outlier, the fact still remains that the SNP has not performed as well in recent elections as 2015 might have led people to anticipate. What has changed is that the SNP faces two issues which were not a factor in 2015: Brexit and Jeremy Corbyn. Those who see independence as the only alternative to neoliberal Tory or ‘Tory lite’ Blairite government from London. Brexit has opened up a new political cleavage, not only within wider Scottish politics but also within the independence movement – including the SNP. The SNP was traditionally opposed to membership of the EU, and campaigned for a ‘No’ vote in the 1975 EEC referendum. It was not until 1983, due in part to Jim Sillars, SNP veteran and one time deputy leader, that the SNP changed its stance to one of ‘independence within Europe’. But by the time of the Brexit referendum, Sillars had changed his mind. In fact, Sillars has stated that he would refuse to vote for independence in a second referendum if it meant re-joining the EU. And Sillars is far from alone. A poll conducted by Lord Ashcroft immediately after the 2016 referendum showed that 36% of SNP voters had voted Leave. In a similar vein, another SNP veteran and former minister in the Scottish government, Alex Neil claimed that ‘five or six’ SNP MSPs – himself included – had voted Leave. The British Election Study has shown that 9 out of 10 SNP voters who voted Yes to independence in 2014 and Remain in the 2016 Brexit referendum, stuck with the SNP in 2017. But the story was different amongst those who supported independence and then voted Leave. In 2017, four out of ten of them deserted the SNP for another party, having been ‘driven away by the party’s strong pro-remain stance’. This is the first new cleavage: the split between ‘hard’ and ‘soft’ nationalists on the EU question. The SNP needs somehow to decouple the independence question from the EU question. One possible solution would be for them to adopt a policy that any future referendum on independence should be a double ballot, like the 1997 referendum on creating a Scottish parliament. In 1997, voters were asked two questions – 1. should there be a Scottish parliament, and 2. should a Scottish parliament have tax-varying powers. A future independence referendum might similarly ask two questions: 1. should Scotland be an independent country? and 2. should an independent Scotland be a member of the European Union? The two issues would thus be disentangled. The second problem the SNP faces is Jeremy Corbyn. Not only are many SNP voters former Labour voters, but modern Scottish nationalism grew under, and in reaction to, Thatcherism and New Labour. They came to support independence due to despairing of the possibility of a more social democratic government. The UK seemed irredeemably addicted to neoliberalism and increasingly dominated politically by the City. For left-wingers who came to see the UK state as essentially irreformable, independence thus became the only viable route to reform. Corbyn represents the end of ‘New Labour’ liberalism and the return of a more social democratic Labour party. In the 2017 UK general election, Labour increased its vote by 38% across Great Britain; however, in Scotland, the vote only increased by 1%. That the ‘Corbyn bounce’ has so far been limited is likely related to the Blairite nature of the leadership of Scottish Labour. Left-wing elements within Scottish Labour have made exactly this point, arguing that the Scottish Labour leadership had damaged Labour’s chances of winning a majority. But the general election changed everything. Corbyn’s credibility as a future prime minister – and thus his hand – was enhanced. Corbyn undertook a five day long tour of Scottish marginals at the end of August. Whether connected or not, Scottish Labour leader, Kezia Dugdale, quit shortly afterwards. Dugdale had opposed Corbyn during last year’s leadership contest and backed his rival, Owen Smith. The leadership contest resulting from Dugdale’s resignation has been controversial – especially for the one time front-runner, Anas Sarwar, who also opposed Corbyn. There are increasing signs of Scottish Labour potentially descending into civil war on Blairite/Corbynista lines. It is still too early to say what form Scottish Labour will take after the dust settles. If it descends into factionalism, or if another anti-Corbyn candidate such as Sarwar, becomes leader, the ‘Corbyn bounce’ will have only limited hop in Scotland. On the other hand, if a pro-Corbyn candidate such as Richard Leonard wins, it may present a problem for the SNP. Iain Macwhirter makes an astute observation when he compares Momentum, the backbone of Corbyn’s Labour party, to the Yes campaign in the 2014 indyref. Both manifest the same energy, enthusiasm, and belief in the possibility of change. More fundamentally, both the Yes campaign and Corbyn’s Labour contain the hope of potential reform of the believed-to-be irreformable. The potential attraction for ‘left-wing’ SNP supporters is not hard to see. There is a world of difference in the SNP contesting Holyrood elections and contesting Westminster elections. In Holyrood, the SNP is contesting to form the Scottish government. Given that the SNP does not contest elections outside of Scotland, it can never form the British government. (Nor, of course, does it wish to.) In a Westminster election, what is at issue is whether Labour or the Tories govern the UK. If a Labour government under Corbyn seems a real possibility, many former Labour voters who voted SNP in recent elections will be tempted to return to Labour. It might be wise for the SNP to make explicit what is already fairly implicit – given that the only choice for UK government is Tory or Labour, they should declare that they would support a Labour UK government. A vote for the SNP in a Westminster general election is not incompatible with a vote for Corbyn as PM. It is not an either/or choice between voting SNP or helping elect a Corbyn government. It is possible to do both – or ought to be. Given that the only choice in Westminster is between a Conservative or Labour UK government, the SNP could adopt a policy similar to Irish parties in the past, such as the Irish Parliamentary Party’s support for the Liberals or the Ulster Unionist Party’s for the Tories. On his grand tour, Corbyn declared that “Scotland holds the keys to delivering a Labour government for the whole United Kingdom.” That key could be delivered as easily by SNP MPs as by Scottish Labour ones. Naturally, Labour would swear up and down (at least in public) that they would never accept SNP support. That is politics. Equally certainly, they would accept it in the event of a hung parliament – that’s politics too. The political landscape has been transformed by Brexit and Corbyn. New political cleavages, more complex than the simple Yes/No binary of the Indyref, have emerged. The terrain is now more challenging for the SNP. But if they are able to tack successfully into the new political winds, these challenges can be met. These are some of the issues that the forthcoming SNP conference will need to address. If addressed successfully, the real SNP ‘peak’ is yet to come. The economics of independence simply do not work. It would be massively expensive, and the best that can be hoped for is that in a generation or two, Scotland would be back where it started. The SNP politicians know this. But they have to keep misleading the faithful, because doing so keeps them in jobs that are better paying than anything they could ever hope for in the private sector. A two question referendum would be a bad mistake. If Scotland becomes independent, it will be up to a future Scottish parliament (which doesn’t yet exist) in a future sovereign Scotland (which doesn’t yet exist) to decide what to do about the EU, and all the other policy issues it will have to deal with. You can’t tie your hands in advance, and if you did, how long would it be for? The last referendum would have produced a “yes” vote if this point had been made and got across to the electorate, thus attracting the votes of everyone who wanted Scotland to be independent, wherever they were on the political spectrum, and however much they disliked Alex Salmond. And an important corollary: the SNP would have disbanded itself, having achieved its goal. Why would we need an independence party if we were already independent?